How many calls do you get every month for duct cleaning services? We receive at least one per week and we just hang up on these guys. However there may be situations where you should consider having your ducts cleaned. But should you have one of these companies clean your ducts? Lets first talk about whether you need to have your ducts cleaned in the first place, then how to deal with these callers. Most ducts do not look like the one in the picture. 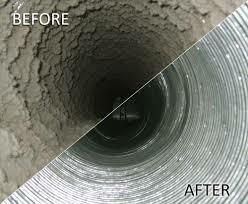 If yours does, then definitely have have your ducts cleaned. We suggest that you check your ducts first and then make a decision. If you keep your home spotless, do not have pets and have not had any major renovation work completed around your home, you may not need duct cleaning. Any time you do renovations, dust is generated. If the AC or the heating system is running, this dust will be drawn into the duct system, onto the heating system elements and the cooling coils. Some will be captured by your filter but not all. Another situation where duct cleaning is needed is when you move into a brand new home. We had ours cleaned and they found dust of course, but also cigarette butts, coke cans and cigarette packs. Consumers who have pets may also need to have their ducts cleaned from time to time. Hair and dander is drawn into the system and adheres to metal surfaces. While many of these companies may be legitimate, some are not. Many will offer a great deal over the phone, however when they arrive at your home, they will try to up sell you on additional services or based on the size of your heating system. Ask for references, review web sites, read reviews as part of your decision process. Avoid agreeing to duct cleaning services over the phone without doing some investigation first. In addition verify what they will actually clean. All ducts both cold air return and heating ducts, vents, grilles, heating and AC components should be on the list. If they are going to open the furnace compartment, they should know what they are doing. Verify credentials before you allow them into your home. While duct cleaning may be needed, consumers can save themselves a lot of money by keeping their homes spotless and avoiding dust and pollen from entering the home. for more information on keeping your furnace running efficiently, click here.